Dare I say this is the salad of the season for me? You guys know I don't repeat meals, except for our absolute favorites, all that often. This meal? This is a repeater...I've made it four times in three weeks and can guarantee it won't be the last time it finds its way onto our table in the next few months. Even Ryan, my mustard-hating husband, gave it his stamp of approval. That's really saying something, because the kale is covered in a mustard-based dressing and there's no hiding the flavor of it! He even went so far as to say he loved the dressing! I think the perfection of this recipe is something in the way the various elements work together. 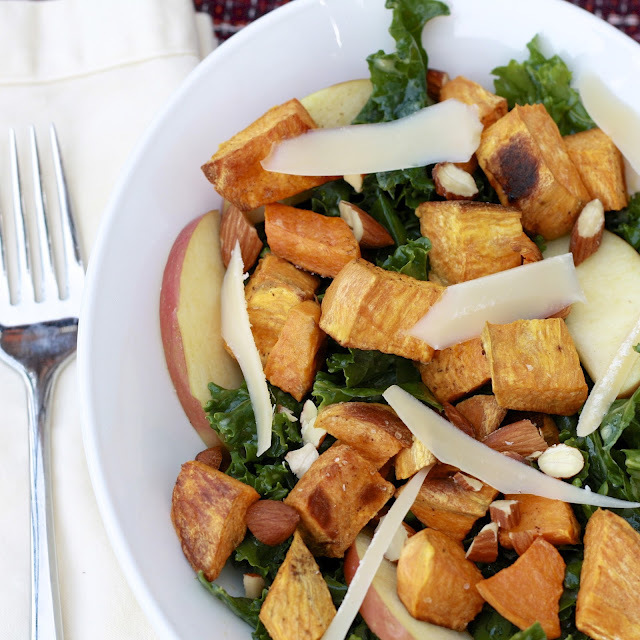 I wouldn't have necessarily combined kale (in a mustard dressing, no less), with roasted sweet potato, sliced apples, chopped almonds, and shaved parmesan, but the meeting of these ingredients is absolutely divine! 1. Preheat oven to 400F. 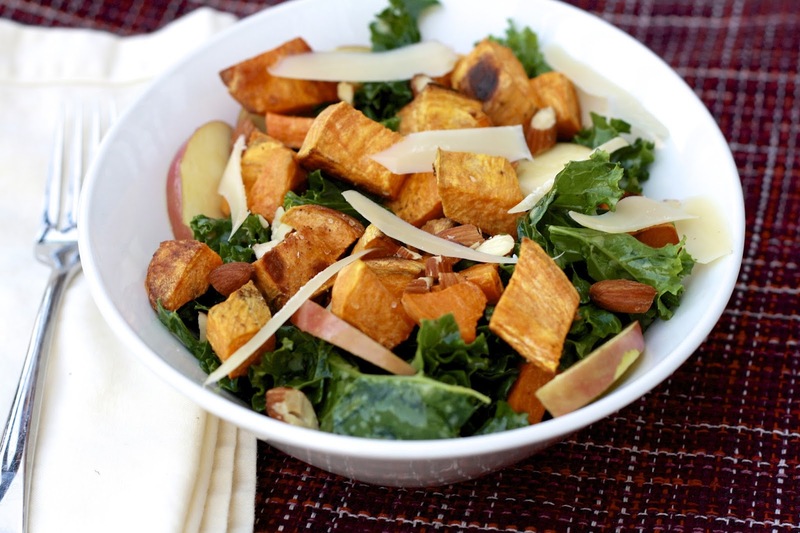 Toss the sweet potatoes with 2 tbsp of the olive oil and 1/4 tsp each salt and pepper. Lay on two baking sheets lined with foil. Roast, rotating the sheets and tossing the potatoes halfway through, for 18-20 minutes, until lightly browned and tender. Allow to cool slightly. 2. Meanwhile, whisk together the lemon juice, mustard, remaining 4 tbsp of oil, and 1/4 tsp each salt and pepper in a large bowl. 3. Add the kale and use your hands to massage the dressing into the kale. (this step can be done up to two days in advance). 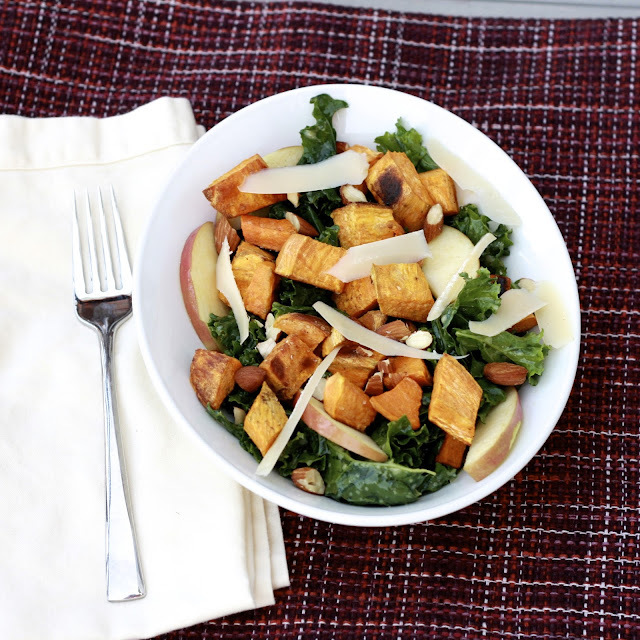 Just before serving, add the apple, almonds, and sweet potatoes. Toss to combine. Serve topped with the Parmesan.